I have revised ‘Defenders of Guernsey’. This second edition, for an 8-to-adult age is now available on Kindle. As a child my grandparents lived in a road in Guernsey called La rue des Grons. When I lived there as a child, and then stayed with my grandparents on every school holiday the few streetlights went off at 10.30. It was very dark and definitely spooky. Just down the road was a spot that my grandfather, David Marquis, used to zoom past at night. This place was known as Le coin de La Biche (the goat’s corner) and was rumoured to be haunted by the apparition of an enormous nanny goat. 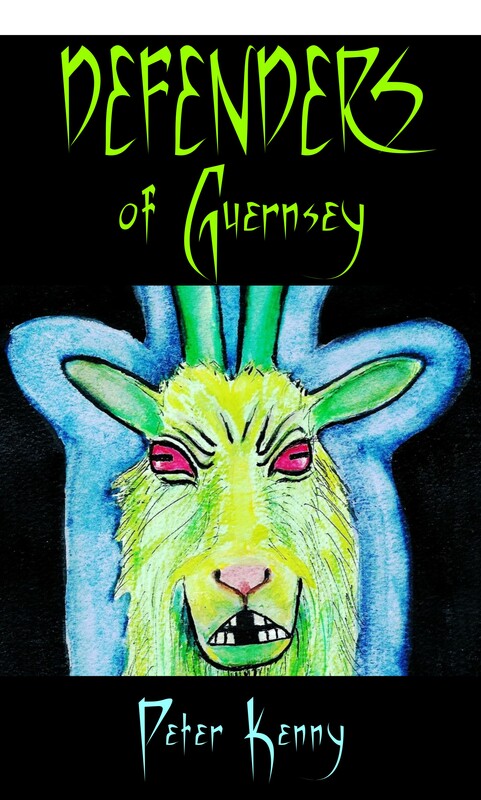 Still the most authoritative book on Guernsey folklore, Folklore of Guernsey by Marie DeGaris devotes a few paragraphs to the giant red-eyed beast and its fearsome sightings, one of which scared a 16 year old girl to death. I was always happy about La Biche, as it’s not everyone lucky enough to have a star of folklore living a hundred yards or so down the road. I’ve been working on a children’s character called Skelton Yawngrave for some time. I am now on the sixth draft of a novel which features him. However, when I was invited to the first Guernsey literary festival in 2011 to talk to some children, I thought I would write a longish (13,000 word) short story called Defenders of Guernsey featuring Skelton and La Biche which was published then as a limited edition. My friend Amanda Milne is developing a board game set on the island, and having read this story borrowed the idea of a terrifying goat. Amanda’s game is now in its a prototype form and being tested by games players. You can read more about the SchilMil game in development here. Defenders of Guernsey now on kindle. My mother Margaret Hamlin painted La Biche for the cover. This entry was posted in Autobiographical, Defenders of Guernsey, Guernsey, Prose and tagged Amanda Milne, Defenders of Guernsey, Folklore of Guernsey, ghost goat, Guernsey, guernsey goat, la rue des grons, Le coin de la biche, Marie de Garis, Skelton Yawngrave. Bookmark the permalink.